The assets of The Community Foundation of Westmoreland County (CFWC) and The Pittsburgh Foundation are co-mingled, resulting in a larger asset pool with a greater return on investment. Through prudent oversight, the Foundation's investment management strategies ensure that the endowment continues to provide for significant grantmaking in our community, now and for future generations. Below: Co-mingled assets of The CFWC and The Pittsburgh Foundation show growth over the last 10 years . 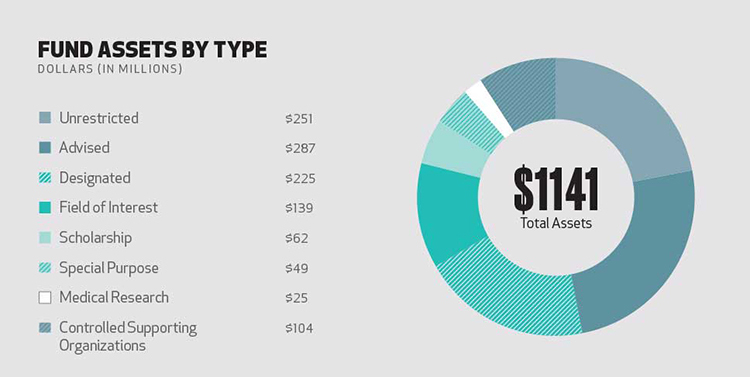 Below: Assets are broken down by fund type. Learn about the Foundation's investment strategies and fund management.